September 2013: Tips eNews & More! Believe it or not, the first day of autumn is already behind us. 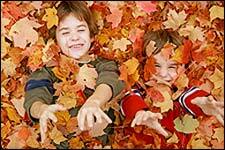 Autumn is a wonderful season which offers many outdoor and indoor activities to keep you active. It also means the kids are back in school! Perhaps it's the shorter days or maybe the self-imposed routine, but everyone seems to be on a mission to get...somewhere. For many of us, autumn feels more demanding than summer. Real or imagined, the added pressure can contribute to stress. While the immediate links may not be obvious, stress and oral health are related. Stress has been linked to bruxism (grinding and clenching), canker sores and even gum disease. Are you looking for a breakfast/snack idea that you can make once and reach for in a pinch? Homemade granola is a tasty and healthy treat that can compliment your breakfast or work as a snack on its own. Making granola at home allows you to control the ingredients and create it to taste, rather than store bought creations that may contain preservatives and fillers that you don't want or need in your diet.